There are a select few fruits that have a solid, unwavering, and permanent – if not slightly terrifyingly obsessive – grip on my heart strings. Peaches are one of them. I am that weirdo that you see standing at the end of the of the fruit aisle in the grocery store with a face prepared to ugly-cry because it’s still winter and peaches are nowhere to be seen. Yes. That’s me. I wouldn’t advise you to strike up a conversation with me in that kind of moment. Furthermore, as much as I am a autumn lover, summer is the season that brings me peaches and therefore I must worship that unrelenting summer sun for bearing such beautiful fruit. I remember one summer, my supervisor brought in a bag of peaches for each of the staff (there is only 6 of us) from her family peach orchard and I’m pretty sure my eyes brimmed with tears of gratitude. I savored each precious peach, eating them slowly and privately – not allowing for any type of distraction. That scene from When Harry Met Sally where she makes some…exciting noises at the restaurant – that was me with each peach. But wait. It gets worse. 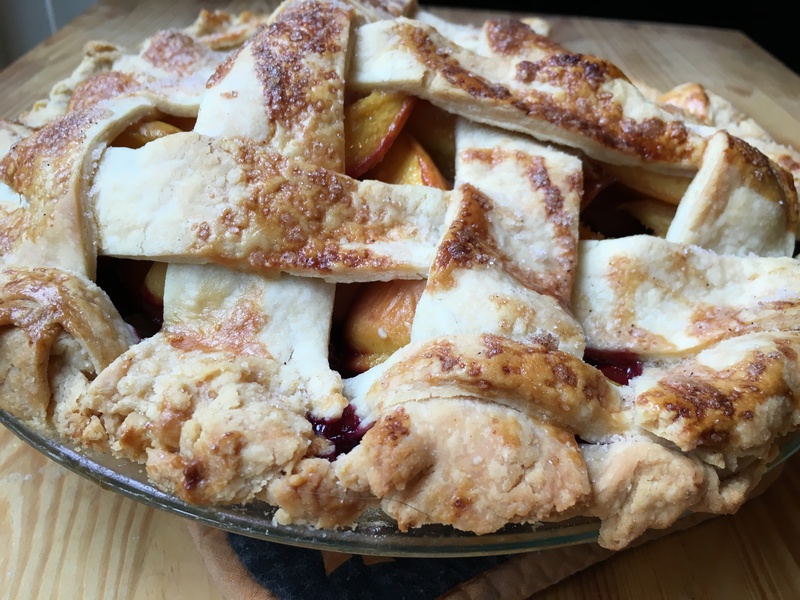 As far gone as I am with peaches – there is also my love of pie. PIE AND PEACHES? PEACHES AND PIE? PEACHES? PIE? PEACHES AND PIE?!?!?!?!?! 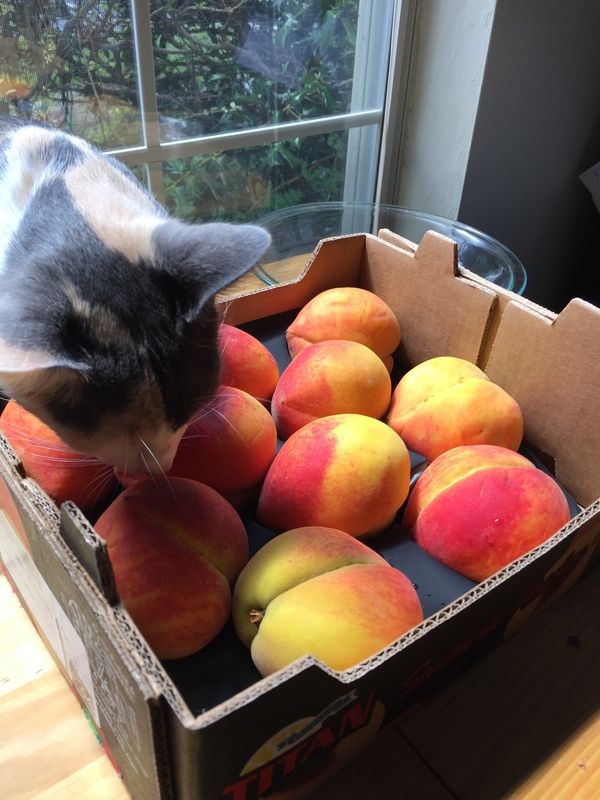 And then pair those lovely, succulent peaches with a splash of bourbon, some gorgeous, indigo blueberries and…well, I’m not sharing. Sorry, loves. Make one for yourself. But touch my pie and you’ll lose a finger. So maybe you’ve never made pie before. Maybe you’re intimidated? If there is one thing you ought to know by now, I’m a pusher. I believe in you and all of your domestic abilities – large and small. Pie is small. Pie is beautiful. You deserve pie in your life, so I know you can wrestle this. It’s easy. It’s soothing. And you can stuff your face after. Just read this recipe the whole way through first and then attack it. You are Batman. You can handle anything. In a large bowl, put your flour and cubed cold butter in and begin to work the butter into the flour. Use the pads of your thumbs and fingers to press and work the butter into the flour until you have a mixture that resembles course crumbs. Once your mixture looks like course crumbs, pour the ice water/salt mixture one tablespoon at a time into the flour and butter and gently mix (preferably with your hands so that you feel it come together) until it becomes moist, like soft clay dough, and comes together in the bowl. Tip the contents of the bowl out onto a cutting board or whatever surface you prefer. Form into 2 discs and cover in plastic wrap and let it rest in the fridge for at least 30 minutes. Make your fruit filling while this chills. In two medium bowls, put the washed blueberries in one and the washed and sliced peaches in the other. Stir the two tablespoons of granulated sugar into the blueberries and half the corn starch, half the lemon juice, and half the cinnamon. In the peaches, stir in the remainder of the corn starch, the lemon juice, the cinnamon and both the granulated sugar and brown sugar and the bourbon . Set bowls aside in the fridge. After the dough has rested – take the first disc out of the fridge and flour your surface (lightly! 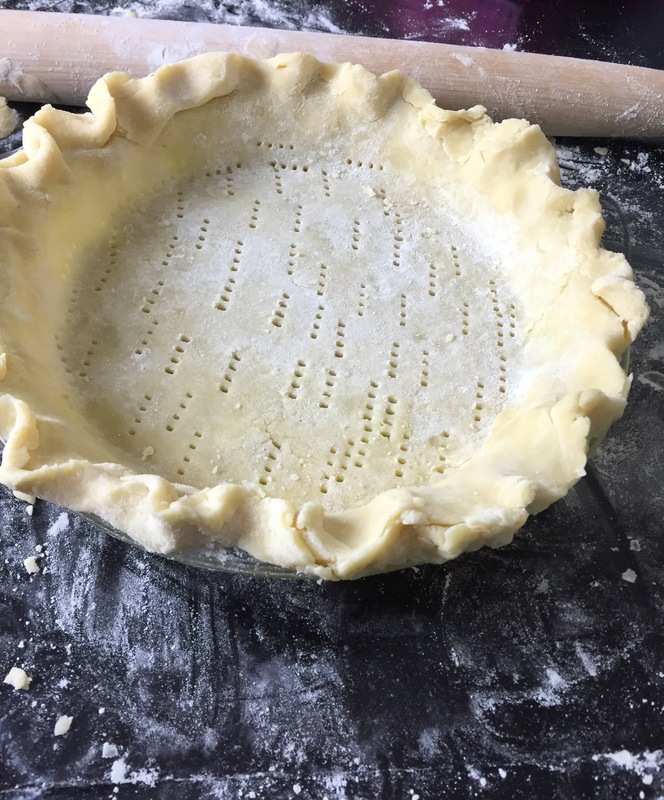 don’t add too much flour or it will make the dough tough) and, with a rolling pin, roll out your dough to about 1/8 of an inch thin and gently press it into your greased pie dish. Crimp and/or cut off excess pie dough. With a fork, poke holes into the bottom of the crust all over and put into the oven for ten minutes. Take out of oven and let cool for 5 minutes. Lower your oven temperature to 375 degrees Fahrenheit. Take your fruit out of the fridge and spoon the blueberries on the bottom of the cooled pie crust first. Do NOT pour in any excess juices that have leeched out from either of the fruits. It will make your pie watery. Scoop the peaches on top of the blueberries. Take your other pie crust out and roll out onto a floured surface. You can simply put the whole crust on top of the filling and crimp the sides as a traditional pie or you could lattice the crust like I did. 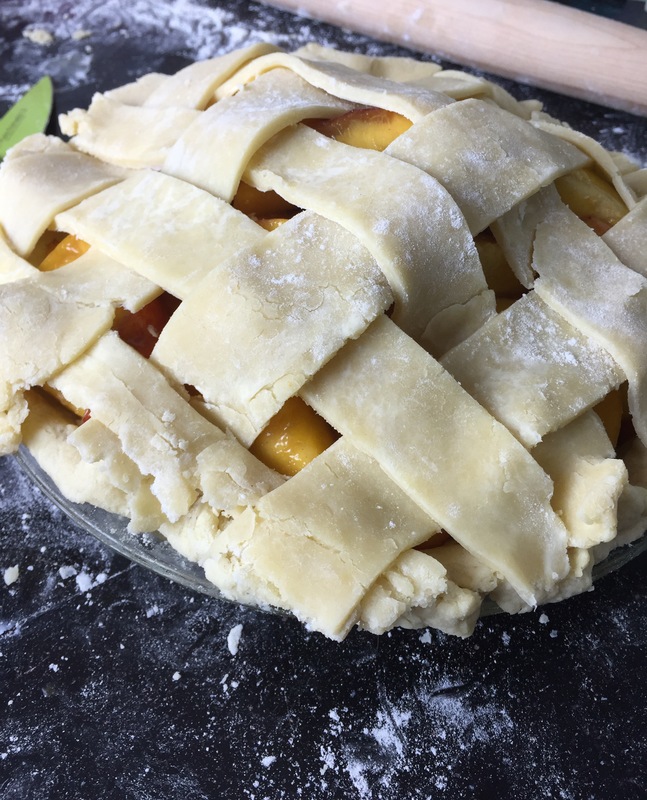 If you decide to lattice the crust – here is a handy dandy YouTube tutorial to help you. It’s easier if you can see the process. (Not gonna lie – I definitely never use a ruler, but I live on the edge like that.) If you don’t lattice the crust, make sure you cut small slits on the top of your crust to let the steam out. Once you’ve finished the top crust, brush with egg wash and sprinkle your sugar and cinnamon mixture all over. Bake in the oven for 45 mins – 1 hour or until the crust is golden brown. Let the pie cool so the filling doesn’t scald your mouth – but that’s never stopped me before! Be blissful in the fruits of your labor. Pie puns are fun. I just love how the beautiful layering effect of the fruit confuses and surprises people simultaneously. I like to confuse people.